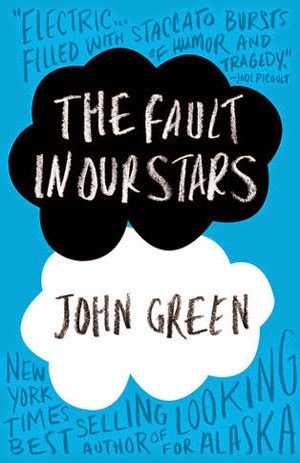 I have finally gotten my hands on The Fault In Our Stars by John Greene. This book although sad because it talks about cancer, was very delightful to read. I say delightful because it is very easy to fall in love with these characters and their dialogue just keeps you alert. Augustus and Hazel have an interesting way of talking. I found their way of chatter intellectual and the characters had a dry sense of humor. I like how Greene shows a more realistic version about cancer then what some other books may portray. It is very sad what people who have cancer go through, but if reading this book helps others get a better understanding of people who have cancer or any other disease. Maybe it will help us to understand how to become a great supportive friend/family member/spouse etc. If you are sensitive when it comes to emotional books, of course, you will need a box of tissues and whatever else helps you get through books and movies like this. I would easily say this is not just a one time reader, and that I would read this more then once. I have also gotten to watch the movie last week. They changed a few things for example, the movies they watched together in the book were different then what they were watching in the movie. Maybe that was because they could not get the license, or whatever they have to do for permission. It was a great movie though, even with the changes. I actually cried more watching the movie then reading the book. So again I say, grab your kleenex, blanket, and stuffed animals to hold, if you are going to read or watch this movie. The only other thing I can say about this book is, Beautiful. So grab your copy and get to it! Have a Blessed Day! I just watched this movie!! I haven't read the book but it's just as you described!! The characters wrap you up in the story, though it is really sad. Nice review! !